Oral history is an exciting resource that can bring subjects to life through the first-hand accounts of real people. We offer training and advice on how you can get the best out of the East Midlands Oral History Archive, how oral history can be used with different age groups, and how you can make oral history recordings of your own. If you have been working on any oral history projects in your school, we would like to hear about them! Please contact us on: emoha@le.ac.uk or (0116) 2525065. 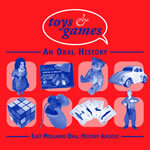 Toys and Games: An Oral History is now available.